The Polar Bear Snowboard School is designed to teach snowboarding to children ages 7-14. 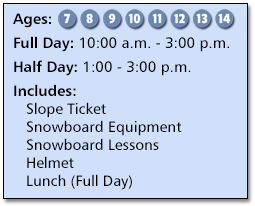 All programs include slope ticket, rental equipment, helmet, lessons, lunch (Full Day only), and supervision. Full Day registration is from 8:30 to 9:30am with the session running from 10:00am to 3:00pm daily. You may also pre-register for the Full Day programs the night before from 4:00 to 8:00pm. The Half Day program runs from 1:00 to 3:00pm daily with registration from 12:00 to 12:30pm. Half Day Polar Bear Program available dependent on instructor availability. The Polar Bear program is located in the Children’s Learning Center. Be sure you bring your child with you when you register or pre-register so they can be fitted with their snowboard equipment and helmet. SAVE TIME: If you are planning on putting your child into the Polar Bear program, you may proceed directly to the Ski/Snowboard School building to purchase your lift/slope ticket as well as to register your child for the program. There is no need purchase your child’s lift ticket or rental equipment prior to registering for the program.